Twelve communities in four different countries will be given their own Torah scrolls this Shabbat, sent by the Beis Yisroel Torah Gemach in Brooklyn, N.Y.
Shavuot marks the “giving of the Torah” at Sinai more than 3,300 years ago. 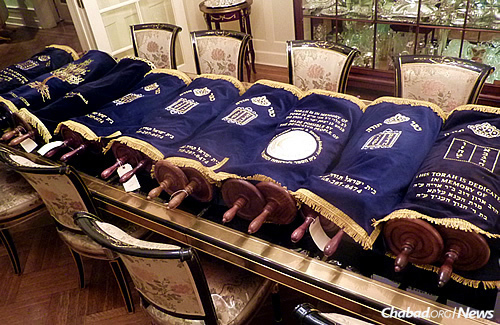 That will have even greater meaning this year for 12 communities in four different countries that will be given their very own Torah scrolls for use by the Brooklyn, N.Y.-based Beis Yisroel Torah Gemach. 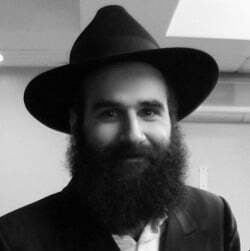 Rabbi Bentzion Chanowitz, who directs the charitable organization, says that fully refurbished Torahs are en route to Paris; Argentina; Waterloo, Ontario; London, Ontario; Gurnee, Ill.; Overland Park, Kan.; Onley, Md. ; Los Altos, Calif.; Amherst, Mass. ; Denver; and Philadelphia. They are loaned out for different time periods, mainly until the recipients can arrange for permanent Torahs. An additional scroll, which is in too poor condition to be repaired, was dispatched to Sharon, Mass. There, Chabad Rabbi Yosef Resnick, who is a certified scribe, will use the Torah to educate children and adults about the process of writing and repairing Torah scrolls, in addition to other ritual objects. Started four years ago, Beis Yisroel Torah Gemach is a project of Merkos Suite 302 in the Crown Heights neighborhood of Brooklyn. 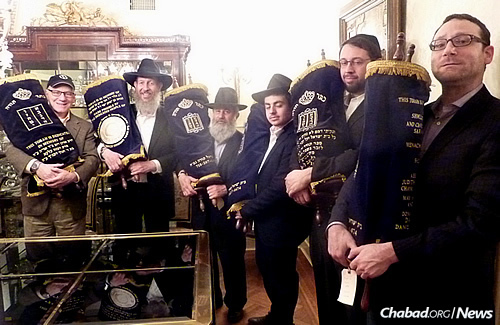 Rabbi Bentzion Chanowitz, second from left, along with those involved in the project display the refurbished Torahs before they are sent on loan to their new homes. 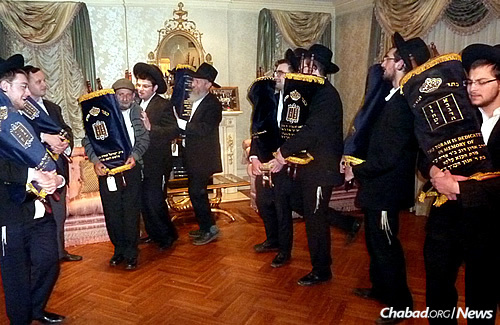 Dancing with the Torahs, some of which will stay in the United States; others will be sent to Paris, Argentina and Canada.